Edith Wharton was, even in her lifetime, considered to be one of America most prominent writers. The first woman to win the Pulitzer Prize for Age of Innocence in 1920, Wharton was a prolific author of books, short stories, poems, travelogues and even books on interior design and gardening. Born into wealthy New York society, her ironic fiction is sardonic and wry study of early 20th century America, touching on class and women's roles and the frustration of the limits imposed by society. But, a lesser known aspect of Edith Wharton's life is her involvement in World War I. Already an expatriate living in France when the war begins, she immersed herself in the war effort, creating several charities for refugees and wounded soldiers. In order to raise money and awareness in America, Edith began working as a war correspondent, traveling through burned-out villages and visiting the horrific trenches, reporting with clarity the ravages of war. In 2014, the world will mark the beginning of the Great War, as it is known. It is fitting to examine the life and work of Edith Wharton during this era of world rending change. 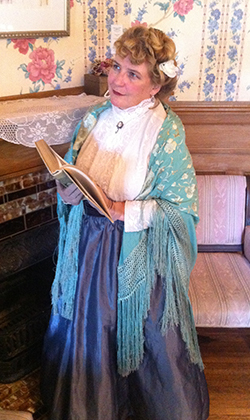 Karen's portrayal of Edith Wharton will a tribute to the life and work of this remarkable woman.